The biggest social network is under scanner now. Facebook platform has once more been breached and I personally feel that it has got much more to deal with than just spam . You think Facebook is not dirty , then give it a second thought . There are two different types of spams that has recently flown through facebook . I will explain both one by one . In the past few days facebook has been hit by almost five different types of spam that are flowing through the chat window of it . You might have noticed that you get a chat from someone in your friendlist saying that "I built your photoshop" , "a teen girl commiting live suicide" etc . You find a link that has been shortened in length . When you click that link then nothing happens , but once you click you yourself get infected with malware and also the same chat message goes to all the online friends in your list . In this way your systems becomes a bot that spreads spam and gets infected too. How to identify its a genuine chat or a spam? Suppose you are using your facebook in internet explorer . Then open another browser say , crome . Now copy the link that your friend has just sent in the address bar and hit enter. 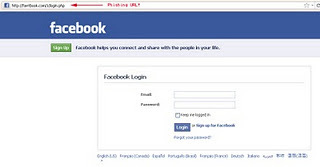 If you see a page that asks for your login information then the link is fake as it is a facebook built application that is ment to spread through your account . No anti virus can identify this spam or malware becouse its running inside facebook . The only countermeasure for this is that "think before you click" . You can first identify the link for any malicious activity using the information provided above and then take some action . 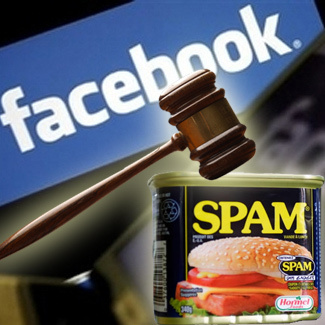 Facebook news feed is now the biggest source of spam . It has now become a million dollar business for cyber criminals around the world . The recent spam that has flown through the feed has two different types of attacks . First it spreads through your wall to other and second is that a phishing attack is launched against you. Look at the following image . Its a video link that has spread through the news feed . This page is the phishing page which ultimetly steals your login information once you enter your details in it . The other type of spam just flows from wall to wall when you click to view it. See the image which features a women from "america's got the talent". when you click the link then the video never plays but the link gets copied on your wall . When I opened the link in a new browser then it asked me to login to my facebook account to view this video . What does this mean? It clearly shows that its an application built on facebook platform to simply spread spam . Dont you think facebook is again evil . Consider this another hot sizzling spam (i think showing hot works well everywhere, be it seduction or be it spam ). once you see this post on your friends wall you get excited to see Marika Frusico(i dont know who she is though) but ultimetly happens nothing and the link gets copied on your wall. How to identify the phishing attack and other spams on news feed. Look at the login image again . The best way to identify that its a phishing page is to look at the url that is there . It will give you a clear idea weather its a genuine or fake login page .Read more about phishing prevention. To prevent from other feed spams you have to be careful . Whenever a new page opens when you click a feed link then dont proceed to play it or enter any details . Simply close the window and check back if its shared on your wall or not . The best way to protect yourself is to remember one thing that , you never have to enter your login details once you are redirected outside the facebook platform . If you are using the same browser then your session is automatically carried to the new tab that you open related to facebook. (for eg , you have opened facebook and logged in , now you open another facebook page in new tab then you are automatically logged in). Whenever you get redirected to some link other than facebook through your feed then dont proceed to play that video or enter your details . Simply close the window and check back if it has got posted on your or not . "Remove post and unlike" will remove it from your wall as well as it will prevent it to be viewed on your feed if next time any of your friends share it. I am not against facebook but at some point i feel that it is still not mature enough to handle 500 million users . They need to grow up faster and faster and will have to strenthen there platform measures to prevent their users from getting exposed to spams . I truly hate saying this but being a pro-google and anti-microsoft i feel that to some extent "facebook is evil". Please do comment about your own views.